For quite I while now I have been thinking of getting myself a drawknife. Everytime I see a video of someone using one to quickly hog off material the spark is lit. Usually though, I talk myself out of it. “I don’t really need it…I can make do”. You know the conversation that takes place in your head when it comes to buying new tools. I think we all do it. Now that I am taking on a few staked leg projects though, I can reasonably justify the need. Turning squares of oak into octagons and then tapering them entirely with a hand plane is a slow, laborious process. So I finally pulled the trigger. Actually, I pressed a few buttons on the computer, but you know what I mean. A few days later the big brown truck pulled up and delivered my new treasure. This is the one I purchased from Traditional Woodworker, 9-1/2″ curved blade drawknife by Mueller. As soon As I pulled it out of the packaging, I headed to the shop and went to work on a piece of SYP that I mounted in the vise. As advertised, this thing hogs off wood with minimal effort and I was surprised at how delicate a cut I could make with it as well. 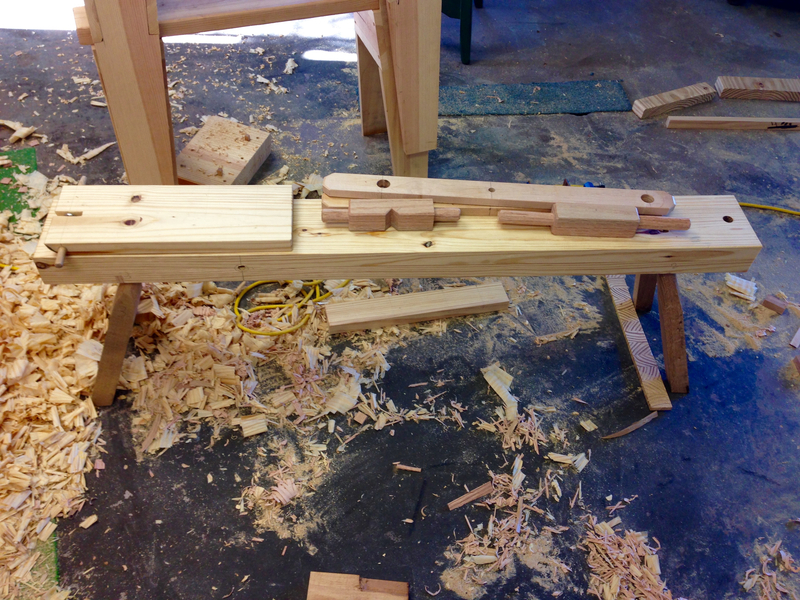 What I didn’t like was how awkward it was to use it on a piece of wood mounted in the vise. The angles and heights were all wrong and, while it works, it is far from comfortable. Thus the shaving horse tangent. A quick Google for shaving horse plans landed me at Greenwoodworking’s website and Jennie Alexander’s plans for an English style shaving horse. Pretty straightforward to build and not too much in the way of material. So back out to the shop for a rummage thru the off cut bin. I managed to root out enough material to build the horse. The only thing lacking was the hardware and a quick trip to the big box store solved that issue. I’ve had a face lamination of SYP hanging around for several years. At one time it served as a makeshift bench when set on my trestle horses. Once I built a proper bench I no longer needed the lamination but couldn’t bear to get rid of it. Finally I have a use for it. I ripped the lamination down to create the bench portion of the shaving horse. The legs are the rejects from a pallet timber that I had broken down for the legs on the Staked Stand project. These rejects have knots and some wonky grain in places, but should be fine for the shaving horse. Nothing on this horse is permanently mounted. So in the event of a failure, a pice can be remade. A chunk of red oak that I picked up somewhere will make the yoke and foot bar. The sides of the treadle frame are made up from maple that I found in the attic. Finally, the ramp is from yet another piece of SYP. Like I said, the construction is straightforward. I had to tweak a few dimensions though, due to my leg material being about an inch shorter than required by the plan. The new drawknife was put to use to create a rough taper on the legs which was then refined with my Veritas tapered tenon cutter. 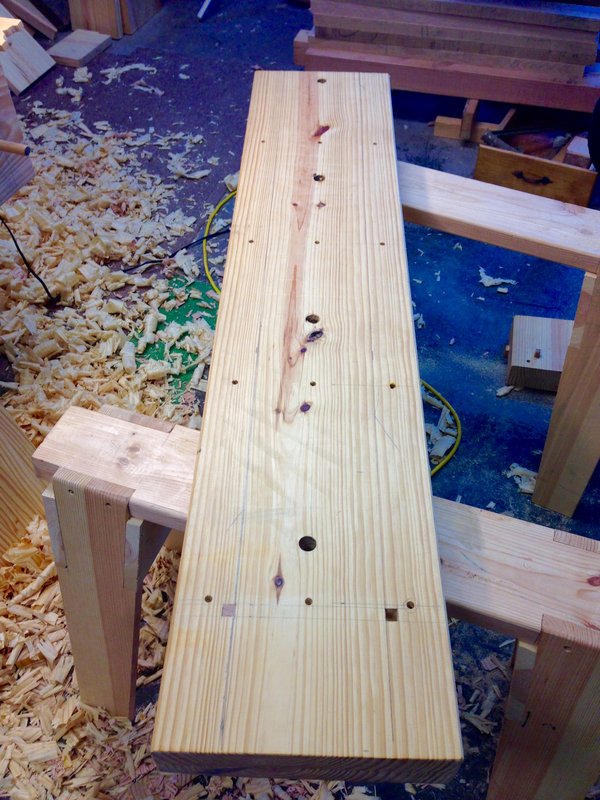 The corresponding holes where cut into the bench and tapered to receive the legs. 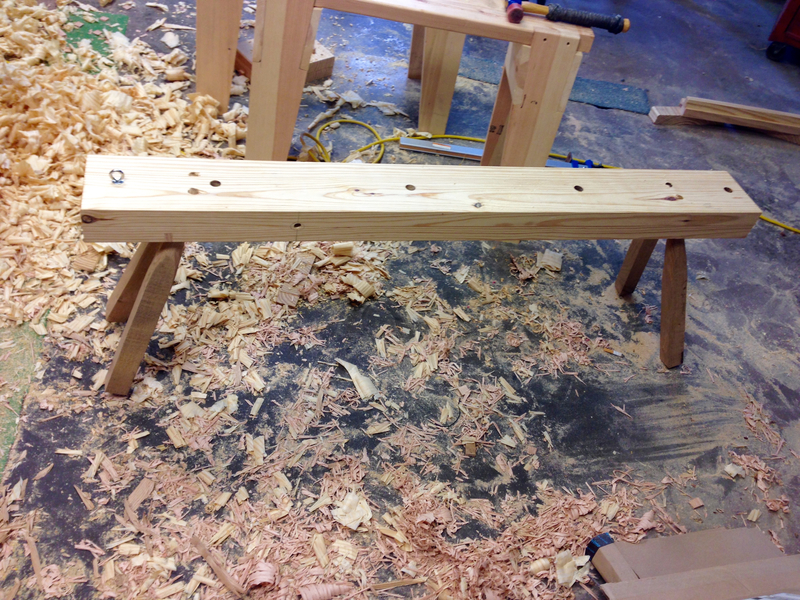 The only fussy bit on this build was creating the 1″ pegs on the ends of the yoke and foot bar. I have no lathe, so these were done with saw and chisel work. Up on its feet for the first time. Treadle parts ready for assembly. I set an arbitrary goal of building this shaving horse in one afternoon. I usually don’t give much thought to how long it takes me to build something, but this seemed like a fun challenge for myself. 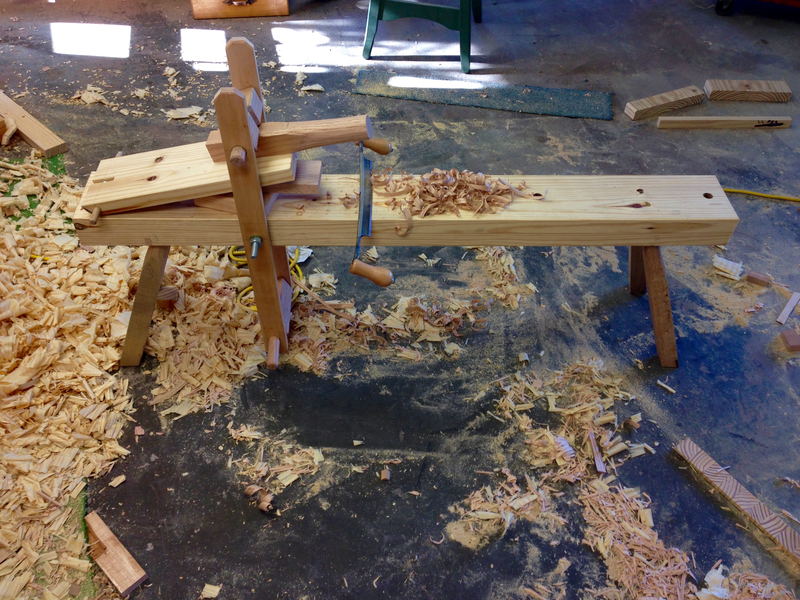 While I did manage to create a functioning shaving horse in one afternoon, it is not quite done. I want to trim a little from the top of the treadle assembly, add a bit of leather to the yoke and ramp, I need to fabricate a proper wedge block for under the ramp and pretty-up the legs a little. This last bit will get me some practice with the drawknife before I tackle the legs on the Staked Side Tables. Now that I have a functioning shaving horse, I’ll just remove one leg at a time and shape it. 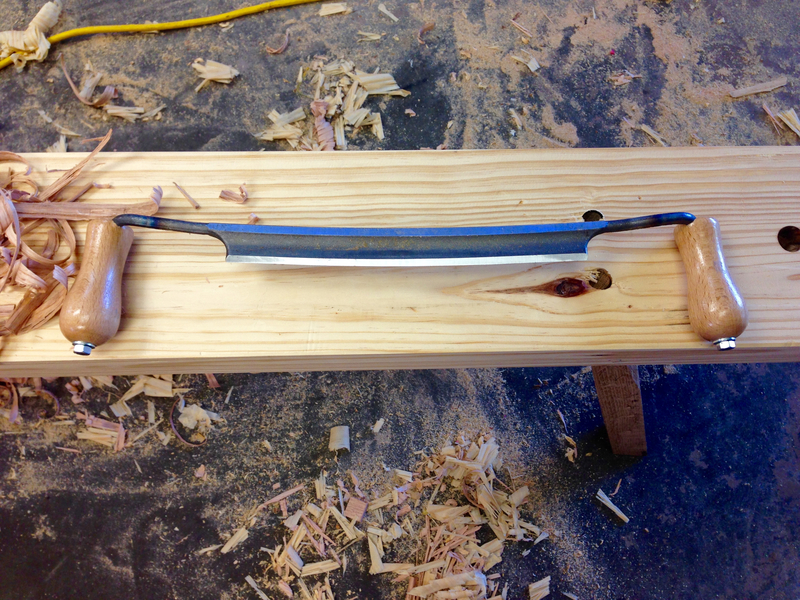 This is my first experience with a drawknife and shaving horse. I can see what all of the fuss is about. Very addictive. This entry was posted in Shaving Horse and tagged drawknife, Shaving Horse. Bookmark the permalink. Dang – one afternoon! That’s great progress. I’ve thought about a shaving horse too, but I’ve really only used my drawknife once or twice in the couple years I’ve had it (and I have no room for a shave horse). I thought the drawknife and shave horse were more for green woodworking. The build went pretty smooth. Yes, they are predominantly for green woodworking, but can prove handy for several operations where a lot of wood needs to be removed. The shaving horse is really just a foot operated vice and should prove useful for more refined operations. Particularly those involving the spokeshave. Time will tell how much use I will get out of this thing. Fantastic post Greg you blew me away, I too have been thinking about getting a draw knife and have tried very hard to justify it but yet I have not found the need, however if I were to make octagonal legs regularly then yes I would get one. There were a few times I wish I did have one but still not enough to justify the extra, it doesn’t mean I won’t because I will just not now. They say there’s a learning curve to it is that true. I have ordered some kit from Lee Valley that is designed for the draw knife but also for the card scraper. Anything to cut down in my sharpening time I’ll take it, sorry I can’t remember the name of this sharpener unfortunately it’s something I’m starting to forget many things in the last year. I’m sure there will be a learning curve like with any tool. The little bit that I have played with it felt very natural. A slight change in your wrist and the cut its altered. I am amazed at how much wood can be removed even in the dry wood that I’m working with. I bet green wood peels like carving soap. Time savings is always good. What I really wanted to lessen is the mundane work. You never know where the path will lead. Hey there, i continue to be impressed at your accomplishments, one afternoon to complete the horse is great. Always been in back of my mind to tackle one for canoe paddles, but just never did. Thanks Brian, but don’t be too impressed. Building one of these is really quite simple. I’ll bet a shaving horse would be perfect for working on canoe paddles. You should knock one together! oh that is a great idea. I was searching too for a simple construction. Yours looks great. And it has a nice approach. Put it on the never ending project list. The design linked above is dead simple and quite adaptable. Hope you get a chance to build one soon. I have two drawknives and like you say, they aren’t as efficient in a regular bench vise. Not much room for a shavehorse in the garage, unfortunately, or you bet I’d whip one up, too. Now you have a shave, a shave horse, and getting into staked furniture – next thing you know you’ll be building Windsors! I’ll see you on Curtis Buchanan’s Youtube page. Windsor chairs…now that is a deep rabbit hole to venture down. If I knock the legs out this thing folds up pretty flat. I bet you could hang one on the wall when not needed. I think this is the coolest shaving horse I’ve seen. Thanks Brian…it came together pretty well for being built mostly from the scrap pile. That is pretty cool. Having a shaving horse is a bucket list item for me. Thanks Jeff. I can’t stress enough how easy this is to build. Lots of forgiveness in the assembly. Don’t get hung up on the materials too much. Use what you have or can get easily (read cheaply). Just awesome! The attic stash keeps on paying off. Thanks! I swear I find more every time I go up there. There seems to be pieces of wood stashed in every nook and cranny. The easiest way to taper the legs on a saving horse, assuming they are pounded in pretty tight, is just to turn the horse upside down and stand over the legs, and shaving up toward yourself with the draw knife. By the way, it is pretty hard to cut yourself while actually using a draw knife. Most woodworking injuries are to the hands, and in this case both hands are out of the way on the grips. True, you are cutting toward your midriff, but the tool allows excellent control. The way you are most likely to hurt yourself is by having the work slip in the jaws of the horse and bonk you in the belly or chest, but that’s the wood, not the tool. The only times I can remember cutting myself are when sharpening, or once when I dropped the knife and the corner of the blade nicked my calf on the way down. As you use the shaving horse and draw knife more, you will find yourself using other tools, like jig saws, coping saws, band saws, power sanders, chisels, and planes less. They either completely replace the need for those tools on many projects, or greatly reduce the amount of material to remove by those other tools. Very good tip on shaping the legs. Yep, in practice the drawknife seems to be a very safe tool. Your hands are out of the way of the blade by default and it is very unlikely that you would ever pull the blade into yourself. The shaving horse is really just a vise. Once you have have one you do start finding more and more uses for it.